There may come a time when a retailer is faced with the need to cut expenses. It could be a slump in the economy or the threat of a new competitor. Or it may simply be the desire to control those ever-expanding monthly operating expenditures. Whatever the reason, there are areas in which retailers can reduce spending without compromising customer service or quality. If your store is experiencing a cash crunch, consider the following ways to cut retail business expenses. Begin looking at the store's budget to find areas that can be cut completely or trimmed back. List every expense the business incurs, all the way down to cash register paper, and then determine where the shop can save money. Tip: Buying in bulk, buying used and comparison shopping are all options for saving money. Every bit adds up. Keep in mind that many business expenses can be negotiated for better rates or terms. Call companies that you currently work with and shop around with their competitors, you may find a better rate that you didn't know was out there. 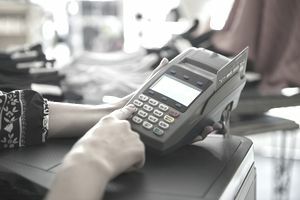 Credit card processing fees - Small businesses may want to consider a service like Square that does not have the monthly fees associated with traditional processors. Telephone and utility bills - Do you need every utility service or add-on you're paying for? Is there a service provider available at better rates? Can you reduce your power usage? Internet and web hosting - Hosting rates vary greatly and it's important to search reliable providers to see if you can save money. Advertising - Are you getting a good return on the ads you are placing? Have you explored other options like social media that are free or low-cost? Professional fees - Can you do more of the accounting in-house? Can you negotiate a lower rate with your graphic designer or handle website updates on your own? Banking services - Is it time to refinance a loan? Is your bank charging high fees on transactions? Do you need to buy checks or can you switch to an online bill pay? Postage and shipping fees - Can you negotiate better rates with your shipping provider or vendors? Office supplies and equipment - Can you reduce the use of supplies or find better deals? Can you make equipment last a little longer or buy a used computer? Overtime pay - Is your schedule getting out of hand and can it be managed better to avoid paying overtime to full-time employees? Is there a problem with efficiency in the store that is causing overtime? Health plans - It is critical to ensure you're always getting the best rates on health plans and worth checking regularly. Business insurance - Review your policies regularly with your agent to ensure you retain good coverage without paying too much. What if your retail business really needs to slash expenses? Trimming costs here and there will help, but you may need to make drastic changes. Before you go hacking necessary sales tools, like advertising and staff, consider completely cutting out any item that is not required to stay in business. Be careful, the idea is to cut any unnecessary expenses, not sacrifice efficiency or professionalism. Cell phones - Do you really need to pay for your manager's phone? Donations - Businesses are popular targets for charity and, as much as you may like to give, it's not the best idea when times get tough. Politely tell them that you've maxed out your donation budget for the year. It's the truth (especially if it's out of the budget) and you don't want to let on that you're strapped. Landscaping - Can you keep the grounds yourself or ask for a volunteer from your staff? Some employees may really enjoy getting outside once a week and naturally have a green thumb. Snow removal - Shop around for your parking lot's snow removal or partner up with a neighboring business to reduce costs. Make sure whoever you hire is reliable so customers can safely get into the store. Janitorial service - This is another job that can be delegated to employees. Magazine subscriptions - Subscriptions are one of the first expenses that can go. Ask a business friend if you can read their copy when they're done with it. Trade organizations and professional dues - You can always join back up when times are better. Plan ahead, create a realistic budget and get the entire staff involved. Employees are more willing to help store owners control expenses when they understand the next cut could be their own job.